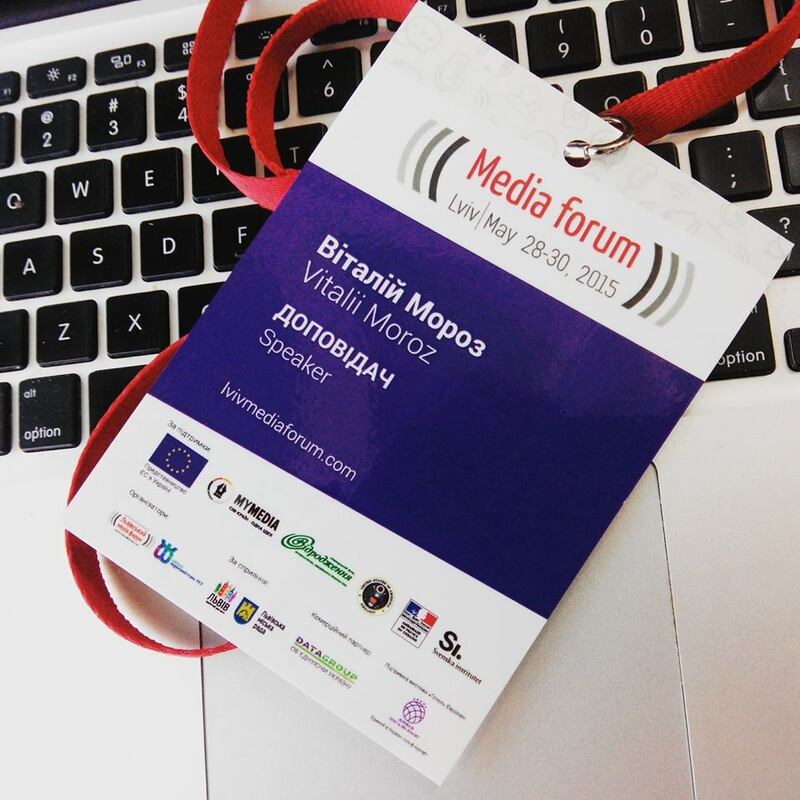 On May 28-30, 2015 Lviv hosted the biggest media conference in Ukraine – Lviv Media Forum bringing together 600 participants from 10 countries. I visited #lvivmediaforum as a speaker on May 30, third day of the conference. According to participants, I talked to, third day was the most successful one – 16 lectures were held in the premises of Ukrainian Catholic University – in rooms equipped for lecturing and interaction with attendants. My lecture on content curation by means of social media for journalists brought 40 participants, including representatives of Kyiv Post, IT Kharkiv (Hromadske Kharkiv), journalists from Odesa, Izmail, Rivne, Lviv and other regions. On the eve of my lecture, ex-President of Georgia Mikhail Saakashvili has been reported to occupy the post of governor of Odessa region in Ukraine, thus, I started discussion with the question on news gathering of the alleged appointment. We have discussed why the news was published online, which sources proved it, what was background of the appointment. The findings were the following – Igor Shevchenko, the minister of ecology was the first who published the news through his Facebook profile. State official, host of TV-shows Anton Geraschenko commented on Saakashvili appointment, advocating the choice of President Poroshenko. Through monitoring of social media, we found out that Saakashvili participated in a big march in Odesa a week before – it could serve as preparations for Odesa residents to accept the appointment. Also, as soon as news was published, Russian bots started campaign to mock Saakashvili. We also discussed hot topics for newsrooms – how to be prepared to cover breaking news or sport events (Ice Hockey World Championship, League of Europe football games). Only few newsrooms in Ukraine plan coverage aiming to involve readers in news consumption. Novoye Vremya, Podrobnosti.ua, 24 TV Channel demonstrates well-prepared strategies to involve readers. For example, Novoye Vremya Coub channel has reached over 9 million views and the number of their coubs surpassed 180 clips. On March 4, 2015, Brookings published a special report targeting the issue of ISIS social media presence. The authors have identified 40,000 ISIS supporters on Twitter. How does it work? What does it mean in the conflicts of 21 century? Thousands of accounts have been suspended by Twitter since October 2014, measurably degrading ISIS’s ability to project its propaganda to wider audiences. For the international community Russian LIfeNews TV channel is a classic example of the worst propaganda and misinformation. It’s so-called journalists follow insurgents in Donbass and appear with their camera as soon as shelling or fight begin. Some even claim, if you see Russian journalists with camera, expect bombing or shelling. LifeNews poses itself as “the most breaking news”. They always ready to pay for unique content – user’s footage of catastrophes or accidents. This week LifeNews team among many other media came to Minsk Summit – Ukraine-Russian-Germany-France talks to stop the war in Donbass through cease fire. On the eve of talk LifeNews journalist Aleksandr Yanyshev assaulted two Ukrainian journalists. He started yelling at them and when run out of arguments, he started …barking. It was shot by other journalists and published online. The episode was widely discussed in social media and central Ukrainian TV stations. Users started mocking the behavior of Russian journalists producing Coub video. Coub is a platform that helps to create looped video. It is easily managed and let users add music and footage from elsewhere. While the international media and world political leaders question if regular Russian troops fight in hybrid war in Ukraine, Russian soldiers in Donbas shoot amateur video and post it online. Officially, Russia declines the presence of its troops in Donbas, but civic activists and journalists have collected dozens of evidences of Russian aggression in Ukraine. Most of it published in social media. In the first video, Russian soldiers are preparing to drive to Vuhlehirsk, a city in Debaltsevo area where heavy fights are led by insurgents against Ukrainian army. “Hello, Chita!”, “Hello, Ulan-Ude!” – Russian soldiers shouting out the names of Russian cities. Chita is located in Zabaikaliye, Russia, while Ulan-Ude – in Buriatia, Russia. In the second video, Russian soldiers in Donbas are fighting against …fish. They used grenades to get fish from the lake in Donetsk region. Soldiers identify themselves, shouting out the names of Russian cities: Cheliabinsk, Perm, Belgorod. Ukrainian media regularly publish pieces about Russian military involvement. On Feb 6, 2014, Cenzor.net.ua published a story about Russian tank captured by Ukrainian soldiers near Debaltsevo. Recently, Ukrainian activists and bloggers have launched a site to collect the names of separatists supporters. The information about more than 22,600 peoples collected so far. If social media is indeed changing the ways in which protests emerge and evolve, then what is learned about the Ukrainian situation will provide important lessons for understanding and anticipating political developments all over the world. First, social media can help to build a protest movement, and it can do so with remarkable speed. Second, once a movement exists, social media can play an important role in recruiting new members and encouraging participation. Third, once protests are in full swing, social media can spread information about them. The interest of researchers for the impact of social media use in Ukraine in 2013-2014 remains high and leads to new publications from worldwide aiming to undestand the nature of social media interaction as a vibrant medium of public discussions and self-organization. Just to remind, in Boston, in May 2014, I have published my thesis about the role of social media in news gethering in Ukraine. On July 18, 2014, Malaysia Airlines flight MH17 has crashed in Ukraine, on the border with Russia, with 298 people onboard. The investigation of the incident examines three main versions of the party responsible for the missile strike: Russian military, Ukrainian military, pro-Russian rebels/terrorists. The investigators should draw their attention to the social media run by terrorists. In the early hours of the strike, the page devoted to the terrorists’ leader Strelkov (Girkin) informed that “rebels shot down Ukrainian AN-26 plane”. The footage added to the news showed the smoke of the crashed MH17. In the aftermath, when it was clear that the target of the missile was a Malaysian passenger plane, the terrorists denounced news about shot of Ukrainian AN-26 plane and deleted it. 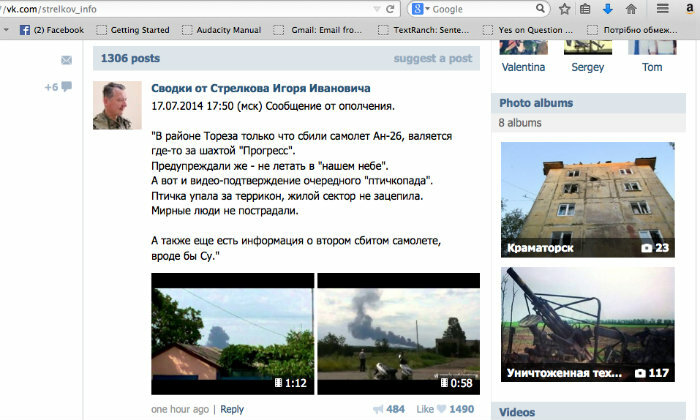 Nevertheless, dozens users have captured screenshots of the news and published it. It might be used as an evidence of pro-Russian terrorists involvement into the biggest plane catastrophe of the recent ten years. Later, terrorists published the news accusing Ukrainian military planes in shooting Malaysian MH17 down. The inconsistency of the coverage questions terrorists’ informational war. Also, Security Service of Ukraine has published a phone conversation between terrorists discussing the crash of the plane. It identifies the names of those responsible for the missile strike. To analyze media activism we should ask, who are the actors and what is their background? To implement media activism online, users should have at least relevant experience in blogging, civic activism and the media industry to understand how to successfully inform about the issues they address. In Ukraine, many successful online initiatives during anti-government protests were launched either by representatives of non-profits or journalists with solid experience in the fields. Thus, their experience helped to bring professional standards to grassroots initiatives, making them more noticeable to the eyes of professional media. One of the examples to illustrate agenda setting by civic activists was the initiative of the Ukraine Crisis Media Center – a temporary institution launched by Ukrainian media experts and public relation specialists in early March 2014. The idea of the center was motivated by the misbalance of media coverage about Ukraine during the Ukraine-Russia conflict in Crimea. The majority of state-owned Russian media used propaganda as a tool to mislead audiences about events in Ukraine. Russian coverage also targeted international media. In response, the initiators of the Center gave a floor to speakers from the Ukrainian government and representatives of the expert community. The center also invited foreign and local journalists, providing them with first hand information, thus encouraging them to generate news within the international and local informational flow, and thus sustaining the Ukrainian point of view on the conflict.